Some housecleaning chores need to be done monthly, others seasonally, and still others just once a year. 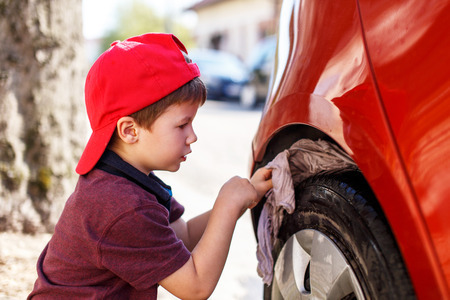 Kids can help with cleaning and detailing the family car to get it ready for the carpooling season ahead. Problem is, we often don't get around to them, or else we add them to our spring cleaning list, which quickly becomes so large and time-intensive, we don't get around to that, either. The solution? Create a monthly cleaning checklist, breaking down all the big, seasonal or yearly housecleaning and home preventative maintenance tasks into smaller tasks you tackle monthly. Here is the August house cleaning checklist that has worked best for me. 1 Ladies and Gentlemen, Start Your Engines! Start your August house cleaning checklist by getting ready for the carpool season ahead by detailing and servicing the car. At least you’ll start the school year looking good! Or rather, clean ball. In fact, clean all your sports equipment and put it away in the proper place. Time is going to be tight in the months ahead. Open up all the windows - and clean them while you're there. Refresh your house one last time before closing up shop for fall. Give your big and little ones brooms and send them on cobweb hunts around the patio, into the garage, and up in the attic. When the last cobweb has been demolished, take the tykes and the teens (and those in between) to a movie or out for a cool treat. Mops, brooms, buckets, and vacuum cleaners get dirty, too. Replace heads on mops (and perhaps the mops themselves), brooms, scrub buckets, and service the vacuum cleaner if needed. Clean trashcans, recycling cans, and the trash compactor. It's amazing how quickly they get dirty and smelly. Touch up the mailbox with a coat of fresh paint. Get fancy if you fancy. 9 Who Ya Gonna Call? An exterminating company to make sure your home goes into fall's closed-window days pest-free. Hot or not now, get your heating system checked to make sure there are no leaks and no unpleasant surprises when cold weather sets in.